AVL develops original software and augments off-the-shelf and open-source software for three-dimensional spatial and temporally evolving data-driven applications and movies. Much of the software AVL has developed is the result of over a decade of work to build a sophisticated visualization software and hardware pipeline. The software pipeline is a collection of modules, utilities, as well as stand-alone interactive and rendering software to handle large-scale scientific data and produce ultra-high resolution (>4K stereo resolution) visualizations. This effort incorporates an advanced suite of data management, rendering, interactive viewing, and display management software. Software components and utilities that adapt raw simulation data into a format that can be interactively explored and rendered as >4k-stereo resolution image sequences. Software components and utilities that transform high-dimensional numerical model data, support feature extraction techniques to identify interesting phenomenon, and create derivative 3D trajectory glyphs of those features. Many of these are custom visualization plug-ins that extend the functionality of Maya (a commercial graphics software package). Software components and utilities to choreograph and view AMR (Adaptive Mesh Refinement) grid distributions and preliminary results of isosurface and glyph creation. Software components and utilities that help to determine computational threshold values, camera parameters, frame ranges, and interpolation settings. These components and utilities orchestrate the creation, blending, and compositing of series of images based on the simulation input data and parameters derived in interactive viewing. Partiview is free, open-source software that was developed by Stuart Levy of AVL. It is an industrial-strength, interactive, mono or stereoscopic viewer for 4-dimensional datasets. It is written in C++ / OpenGL and has been compiled to run on Linux, Windows, OS X, and Irix. Virtual Director is a collaborative choreography tool for scientific visualization. It allows users to use 6 degree-of-freedom (6DOF) input devices to interactively navigate through a dataset and record and edit camera paths. These camera paths can then be fed to a high-quality, offline renderer for production. Version 1 was patented by Donna Cox, Bob Patterson, and then-graduate student Marcus Thiebeaux. Version 2 (currently in use) was written by Matt Hall with contributions by Stuart Levy of AVL. 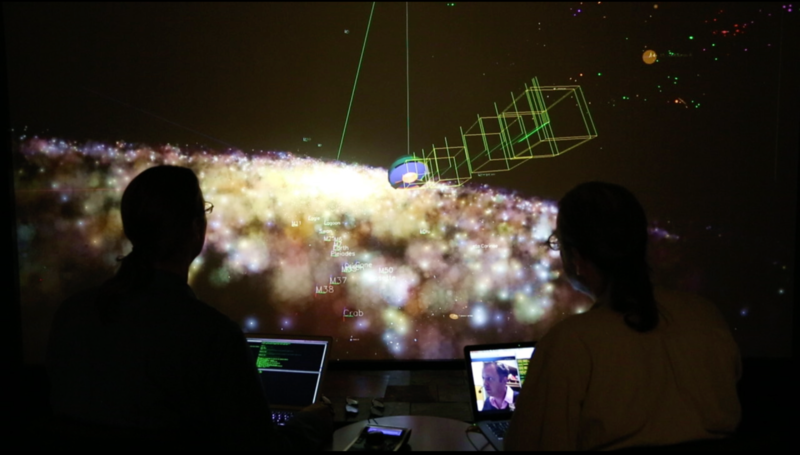 Virtual Director has been used to help create several high-profile IMAX movies, digital planetarium shows, and television shows, including the Oscar-nominated IMAX film Cosmic Voyage (1996), Hayden Planetarium’s The Search for Life: Are We Alone? (2002), and the PBS NOVA episode Black Holes: The Other Side of Infinity (2006). Supports 6DOF input devices such as a 3dconnexion Spaceball or an Intersense wand. Able to render in stereo. Allows remote collaboration: collaborators show as avatars in the scene and can share and follow one another’s camera paths. Runs on Linux and MacOS X machines. Modular design allows for easy addition of new input devices or new visualization renderers. 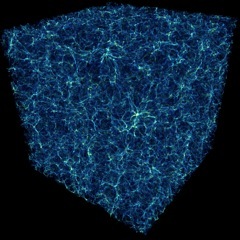 Ytini is a collaboration between AVL and Jill Naiman of the Harvard-Smithsonian Center for Astrophysics to use yt* as a data reader for Houdini**. Ytini uses yt to read volumetric data and convert it into Houdini-readable VDB files. This allows Houdini to read any data format that yt can read, with minimal to no additional effort, not requiring a custom data reader plugin for each now data format, and cutting down weeks of development time per visualization. Support for Adaptive Mesh Refinement (AMR) has been added in 2017. Ytini is an open-source project, with files and tutorials distributed through www.ytini.com. * Yt is a scientific analysis and visualization python package, which is a great scripting/command-line tool for rendering complex data types. It does not have a user interface, which means it is a tool for programmers and scientists, rather than artists. ** Houdini is a 3D animation software, a tool for creating cinematic visual effects. It allows for combining volumes and geometries (e.g. a tornado along with a ground plane), and gives artists many tools and much flexibility in design. It does not natively read any scientific data formats, which makes it a tool for artists, rather than scientists. Amore is a high-quality volume renderer for Adaptive Mesh Refinement (AMR) datasets developed by Matt Hall of AVL. It can be used for single AMR timesteps or as part of a chain of tools for animation of time-refined AMR datasets. It is written in C++, and has been compiled to run on Linux and Mac OS X. Release Status: We have requested that the University allow us to publish Amore under an open source license. It is expected that our request will be granted, at which point we will provide download instructions here. Initially, just the renderer will be released. However, eventually, we intend to release the full suite (which includes a temporal interpolator and fast transfer function previewer) as soon as it can be properly documented. Genie is designed to be a simple interface to create atomically accurate DNA models based on real gene sequence data. 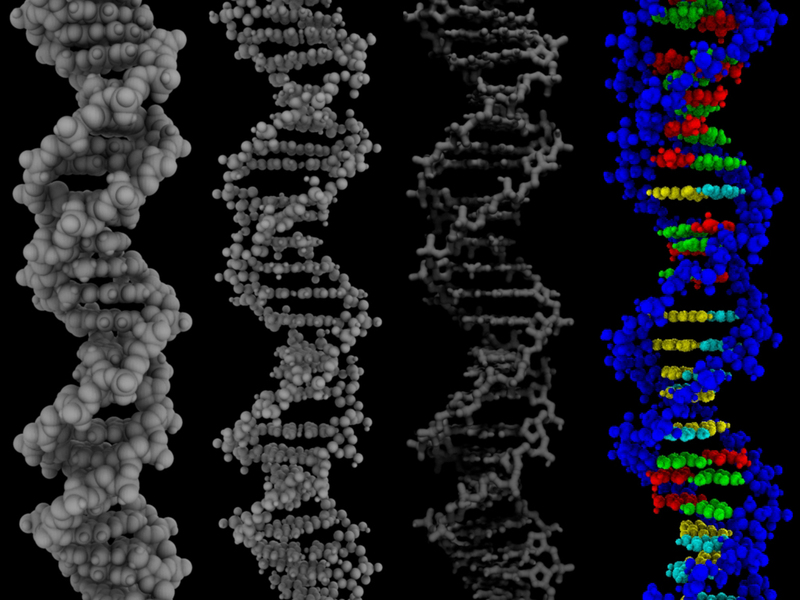 It allows the user to create data in a number of geometry types and update the rendered appearance of the dna through variables like bond lengths, atomic elements, and molecular identities. It has been used in an ongoing research project of the Human Papillomavirus, and easily handles the virus’s nearly 8000 base pair genome. It has been created with expert advice from Joanna Shisler, a virologist at the University of Illinois, and with help from Raji Heyrovska from the Academy of Sciences of the Czech Republic. NCSA’s Advanced Visualization Team partnered with Argonne National Laboratory to create Metropolis, an open source interactive visualization tool for traffic engineers. When city planners model the flow of traffic through an urban road network, they use the results of their simulations to predict normal traffic patterns, ameliorate traffic delays due to road closures, and determine the best evacuation plans in case of emergency. Unfortunately, most tools they have to visualize the results of their simulations only show single snapshots in time, rather than the dynamic flow of traffic. Metropolis allows engineers to look at and follow the individual “virtual vehicles” in a simulation, to view the traffic metrics on individual streets, and to pick out hotspots in an urban simulation. 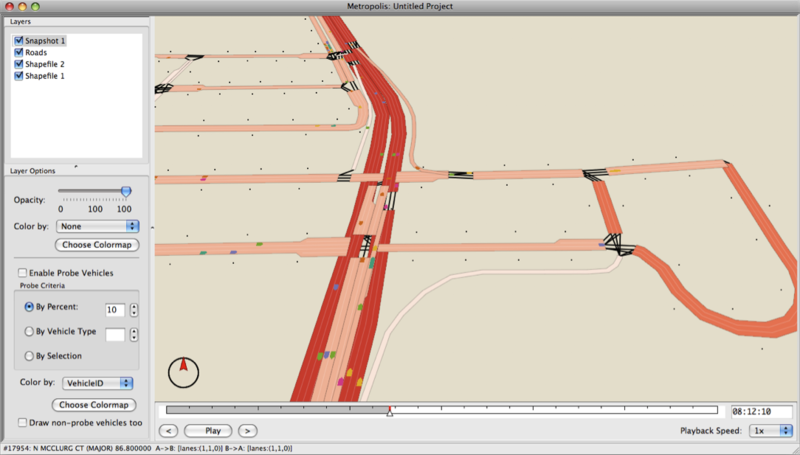 Metropolis is designed to work with output from TRANSIMS, a suite of simulation tools used for traffic planning worldwide. AVL’s oceanographic simulation software, treating isosurfaces and trajectories, was developed by Matt Hall and Stuart Levy. A tool for extracting isosurfaces from oceanographic simulation output, such as from ROMS or HOPS. The application also has the ability to compute depth-adjusted means and standard deviations, so that statistical isosurfaces (such as temperature relative to the depth-adjusted mean) can be generated. Release Status: Ocean isosurfaces software & documentation can be downloaded here. 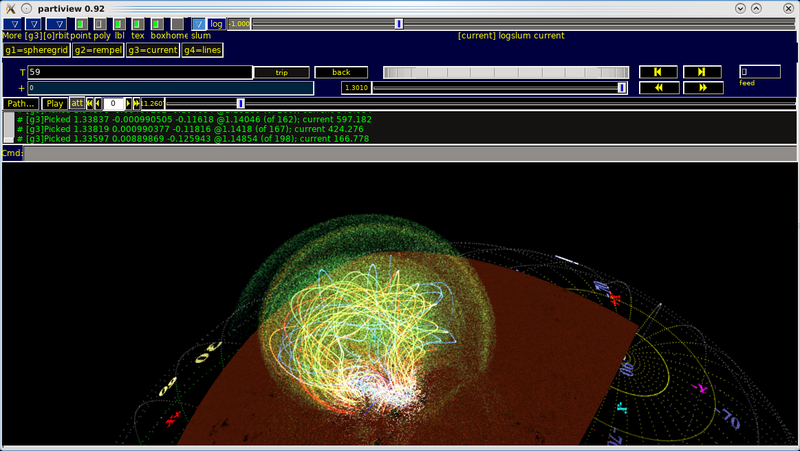 Tools for computing trajectories of particles in a time-varying fluid flow, described by a series of HDF or netCDF files. Particles can sample values of other fields, including synthesizing quantities such as vorticity. Release Status: The main trajectory-computing code is not included here (though it may be released later), but documentation of its input and output formats, and related software for processing and visualizing the advected particles, is here. The Illinois Early Childhood Asset Map (IECAM) developed by Lorne Leonard (formerly) of AVL gathers data on the capacity of various early education services (for example, Pre-Kindergarten, Head Start, child care) in the state, along with demographic data (for example, population, poverty level, language use). Presenting these data in both table and map format allows interested persons in Illinois (for example, policymakers, administrators, state agency personnel, child care providers) to identify how many children are located in regions in the state and the capacity of early education sites to serve children. By comparing these data, providers can more fairly distribute services to children and state funding agencies can more efficiently distribute funds for programs. As a result, state dollars for early education services are more efficiently distributed and the children of the state are better served.